BELFAST, Maine — Cradling an old volume in his hands, George Siscoe gets a twinkle in his eye when he speaks of the book’s origin and content. Owner of the Old Professor’s Bookstore on Main Street, Siscoe offers customers a range of knowledge about the many rare, old and interesting books featured in the store. And Siscoe actually is an old professor, having taught meteorology in the UCLA atmospheric sciences department for 25 years. He still spends his winters as a research professor at Boston University. 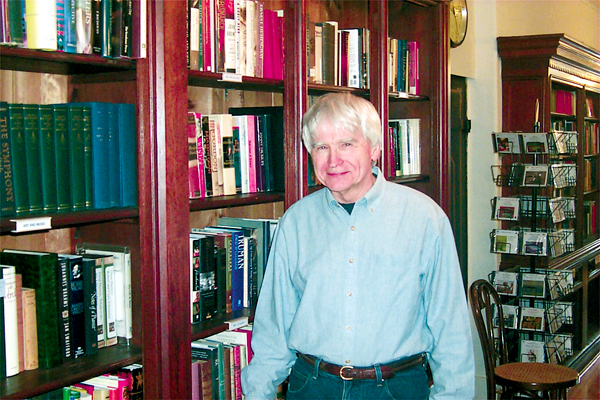 Siscoe and his wife retired to Islesboro in the mid-1990s and opened his bookstore last year. From his island home, Siscoe takes his bicycle to the ferry each day and travels to Belfast by car from Lincolnville Beach. “My wife hates Los Angeles, so as soon as an opportunity came up to move east, we took it,” Siscoe said. Once a jewelry store, the retail space has fine wooden cabinets and shelves along both walls that are filled with books. Also on display are Siscoe’s collection of antique microscopes. A modern microscope is there to occupy children with close-up images of things such as dead ants while their parents pour through the stacks looking for something of interest. One-half of the store is devoted to science books and the other to the humanities. Siscoe has a particular fondness for books by Charles Darwin, including a second edition of his groundbreaking “Origin of the Species” and a rare, 29-volume collection of his entire works. There are books on religion, histories and novels. “The general theme is that these books are supposed to satisfy the two big questions: What is? and What matters? That’s basically what this shop does,” Siscoe said. Although he has collected books for more than 30 years and many of the volumes for sale in the shop come from his personal library, Siscoe never thought of owning a book store. The idea just popped into his head while he was walking down Main Street one day, saw a building for sale and thought it would make an ideal book store. One feature about the store that has made people stop and take notice is the window display. Each week Siscoe picks a theme pertinent to that week in history and puts corresponding books on display. The window also has a video screen that broadcasts a continuous loop of information about the subject at hand. As an example, Lewis and Clark set out for the West Coast in May 1804, so the display for May 10-16 featured books dealing with their adventure and the exploration of the West. For the week of Memorial Day, Siscoe has planned a display on the Civil War. The national holiday, then known as Decoration Day, was established to honor those who served in that war. Mid-June is when Benjamin Franklin experimented with a kite in a lightning storm, so Siscoe plans to have “a lot of electro-static stuff” in the window. “It’s a great way to expand your inventory. You pick a theme for the week and then you gather the books geared to them,” he said. The Old Professor’s Bookstore is a few doors down the street from the Fertile Mind Bookshop, but the two cater to a completely different clientele. Fertile Mind sells new books, gifts and newspapers while Siscoe specializes in old and rare books. Siscoe said he decided to move to a cooler climate after attending a lecture in the 1980s by atmospheric scientist Jim Hansen, one of the first in the field to popularize the theory of global warming.